As a teacher of the Alexander Technique I am often looking for the right words to describe the qualities of moving and doing, of being, which I am hoping students will find. My least favourite is ‘posture’ or ‘good posture’. To me it suggests stiffness, and a notion of correctness which adds another layer of emotional or behavioural fixedness. I will happily speak of freedom, or poise, or responsiveness. I am a little wary of the word ‘grace’, because of its religious connotations, but I think the meanings that hide in this short word teach me, and challenge me, to acknowledge the depth and complexity of what we are touching on in working on ourselves in the way we do with the Alexander Technique. The first significant publication of the French philosopher, Simone Weil, only published after her death during the Second World War, was given the title Gravity and Grace. She lived out her short and restricted life in appalling but welcomed suffering, a bleak existence with moments of release into the divine presence. Gravity and Grace were both intense experiences in her life but connected only by their both being beyond her understanding. I believe we can find a way in to the life that flows between these two dimensions, gravity and grace, that need not crush us. I find it interesting that the idea of ‘gravity’, has, through many languages, right back to Latin, combined the ideas of heaviness, of downwards, and of importance. A grave matter is significant. What is light goes up and is frivolous. Gravity is what matters! Grace, from the beginning, was an idea reborn in Christian thinking, expressing the essence of the new experience of the immanence of the divine. Its import became even more intense with the Reformation and reveals ambivalence about individual selfhood. Martin Luther suffered severe anxiety, fear of death, a sense of personal moral failure and divorce from the divine. Yet he was the one to encourage individual spiritual experience and response to the Gospel. Martin Luther writes of “a free surrender and joyful bet on [God’s] unfelt, untried and unknown goodness”. Just as people are finding themselves as individuals they discover the need for renunciation, for grace. A conviction has been born that there is something which, by nature, we do not have, but which we can’t do without, and which we can’t engender for ourselves. On our own we can only worry; strength comes from letting go into the liberation of grace. 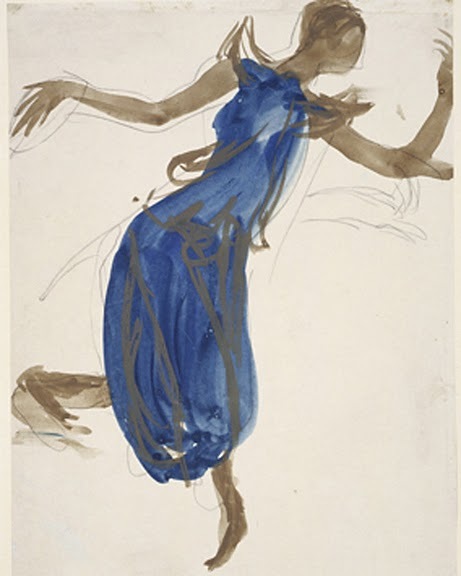 Here is the link to the grace of movement, the image of the dancer (look at Rodin’s sketches of Eastern dancers), self-surrendered in graceful motion. I want to suggest that we sense a strong impulse of the unconscious in such grace; of fulfilled contact with the world through the body, beyond the intellect. In the dance our desires are fulfilled, perhaps even as spectators, without our becoming weary. There is life in us. It feels to both the dancer and the spectator, ideally, that a power, beyond that which normally fuels our achievement of individual goals, is embodied in the dance. We know that such joy is not the only expression of that unconscious power – it is also the region from which clumsy giants and lumbering monsters can emerge. I want to look for the polar quality, or complement; the necessary partner to the grace of the unconscious, which can bring just enough balancing clarity of consciousness to meet the sometimes frightening energy of the dark depths. I want to begin with the idea of dignity, or worth – the two words are connected. This is the question which many of us ask ourselves – Do I have a place, am I recognised, am I important? And we ask this question of other people, of things as well. This is the world of gravity with its tendency towards drawing in towards a centre, towards this heavy important person or book or problem. But can we let that go and keep the clarity, the imagination, the curiosity? As we become aware, as we compare and learn, can we enter into comparison without immediately thinking in terms of ‘better’ and ‘worse’? Another way of looking at gravity and grace is via the fundamental flow from ‘form’ into ‘movement’. Practice in the Alexander Technique is about enjoying that moment of movement beginning, of a human intention disappearing into the active limbs. When we bring movement to an end then stillness returns with, perhaps, an enlivened sense of our form, our body. In our inner life we can practise an interchange between stilling, pausing, and then the directing of our thoughts, feelings and intentions (still as inner activity), through our bodies and out into the world. As we engage in this inner and outer work then the influence of movement in stillness, and the presence of the form found in stillness in the flow of movement, bring together gravity and grace. The dignity, the recognised place of the self, becomes one with the grace, the moving desire of the self. Both exist in, and are held by, the other. Rudolph Steiner, in a lecture entitled ‘Facing Karma’ contrasts what he feels are the most helpful attitudes to, respectively, suffering and joy in our lives. He suggests that, if we can create moments of pause, we can come to realise that we have sought out, or can welcome, certain times of pain or suffering which have allowed us, or which we believe will allow us, to develop. Given the chance, we would normally not choose the road taking us towards suffering, but, at times, what Steiner calls ‘the wiser being in us’ can act without our knowing it, or we can create those “sacred moments”, as he calls them, in which we still the voice which would always avoid pain. Regarding happiness and joy, Steiner suggests that we take a different path, not connecting these experiences to our own personal path of development, but, rather, just dwell in the sense of gratitude and allow ourselves to consider our happiness as grace, as an experience of “being embedded in the divine forces and powers of the world”. He recommends this attitude not in order to deny ourselves pleasure, but because “thinking about joy and happiness have a paralyzing and extinguishing effect” if we are connecting our happiness to our centre of self, our gravity. Suffering draws our insubstantial thoughts down into gravity: gratitude allows a happy movement of release into a divine, unburdened world of creation. Perhaps in the child absorbed in play on the beach, or the old couple dancing to a favourite tune we see gravity and grace, dignity and release, working together in ways those of us immersed in the middle of life have to work to achieve. Grace acknowledges a power working in us which allows us to take hold of movement, pain, our path through life, without being overwhelmed by heaviness.